"We condemn racism and bigotry in all its forms," Pfizer spokesperson Sharon Castillo told ABC News last Tuesday. "We are withdrawing our support and have requested a full refund of our contributions, which were made months in advance of the senator's comments." When actress Debra Messing criticized Walmart for its donation to Hyde-Smith, the company responded that the senator's comments "clearly do not reflect the values of our company and associates." 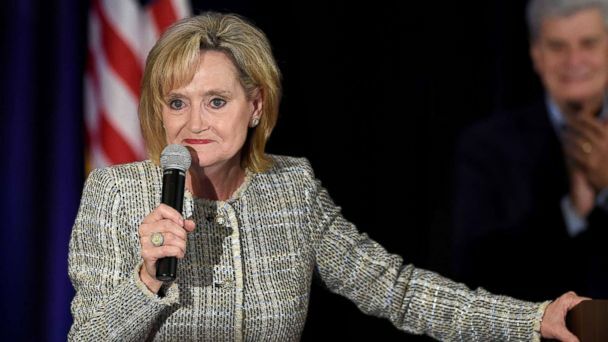 Four days after the first video surfaced, another video from Nov. 3 was tweeted in which Hyde-Smith tells a group of supporters in Starkville, Mississippi, that it would be a "great idea" to make voting "just a little more difficult" for "liberal folks." Hyde-Smith's campaign once again refused to apologize and released a statement saying, "Obviously Sen. Hyde-Smith was making a joke and clearly the video was selectively edited."